I visited Nara the next-to-last day I was in Japan. I didn't know what I was going to do, but a friend suggested Nara (and Kobe -- I never did make it to Kobe) and at the last minute, we decided to go there. 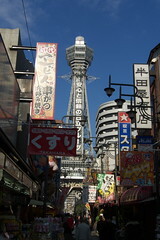 The last day, I wandered around Osaka a bit, then was off to the airport and (eventually) back home. Jet lag is a b*tch. This is it, the last set. The whole set is available here. Perhaps the picture is, uhm, like a really good angle? Right off the sides are the rust stains, broken pipes, rubble, trash, right? After China, it looks like one of the nicer neighborhoods. For Japan, yeah. Which is kind of the point.